Water is one of the most misunderstood sectors of the global economy despite trailing only oil and gas, and power in terms of capital investment. The very limited supply of fresh water and an alarming growth in demand is well understood by many people at a senior level. However, due to the sector’s ill-defined nature, it is not on most investors’ radar screens. Typically when institutional investors are designing new equity investment funds, they look at which sectors will have the most attractive long-term fundamentals and then structure their funds accordingly. We view the global water sector as being one of the most attractive areas of focus through 2030 because more capital will have to be spent there than all other major infrastructure requirements combined. Using this expectation we advocate investors identify companies that are positioned to take advantage of the some $22.5 trillion in spending that is expected over the 2005 to 2030 period (see exhibit X). This top down approach is also a way for individual investors to position their portfolios to gain exposure to new and/or high growth sectors as part of a larger balanced investment strategy. With this limited supply we are already facing water stress and scarcity conditions in many parts of the world today. In fact many future conflicts will be about water. This existence of scarcity is less based on a limited supply than on a rapidly increasing demand (see exhibit below) due to factors such as population growth, pollution of traditional water supplies, urbanization, and increases in overall wealth in the developing world. Most of this demand is not necessarily for direct human consumption, but has to do with the “hidden” uses of water. Most of the goods and services we consume require enormous amounts of water as shown in the diagram below. For example, the production of 1 kilo of coffee requires 20,000 litres of water, whereas one cotton t-shirt uses 7,000 litres of water! Water is the only asset we are aware of that has no substitute at any price. Everything else from various food sources to the oil you put in your cars has a viable substitute. Moreover, water is treated as a fundamental right and not as an economic good like other key resources in most parts of the world. 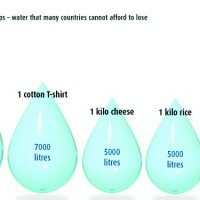 For this reason, governments subsidize water costs beyond those of other products. As shown in the bar chart, it is by far cheaper than many comparable products/resources. This view towards water has been changing drastically in recent years due to scarcity in many parts of the world. 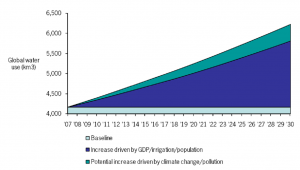 Also the only viable way to fund the replacement of crumbling infrastructure in the developed world and new infrastructure in many parts of the developing world is to assign a more realistic value to water—this may not always be great for consumers’ monthly water bills, but provides excellent opportunities for investors that have exposure to water stocks. In this value chain, there are several distinct elements, but most of them are highly connected. Utilities represent large parts of the value chain from the sourcing of fresh water supplies up to the three large consumption points (agriculture, industry and municipalities/households). Following consumption, utilities again take ownership of the water and treat it for disposal or reuse in a similar or different application. All along the way, there are a variety of companies providing goods and services to utilities and consumption points. 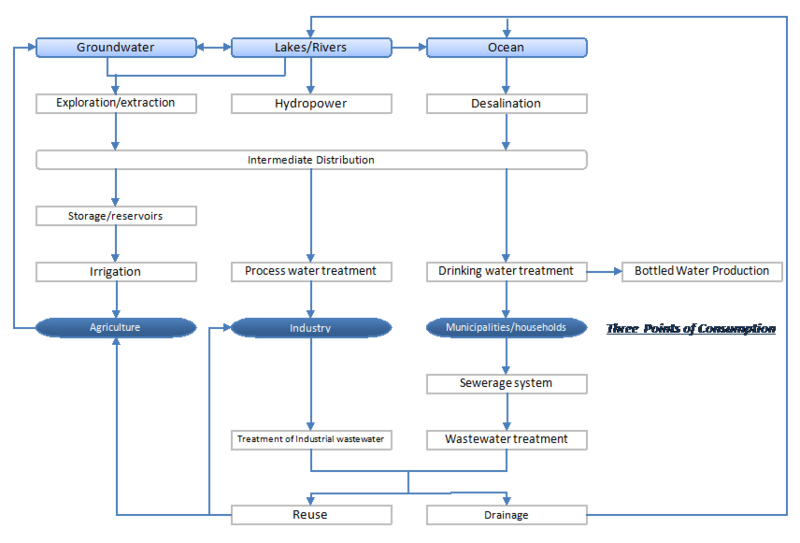 There are also unique offshoots, like the bottled water industry, that are very tangible parts of the global water landscape. Water utilities are likely the most obvious way to gain exposure to this sector. 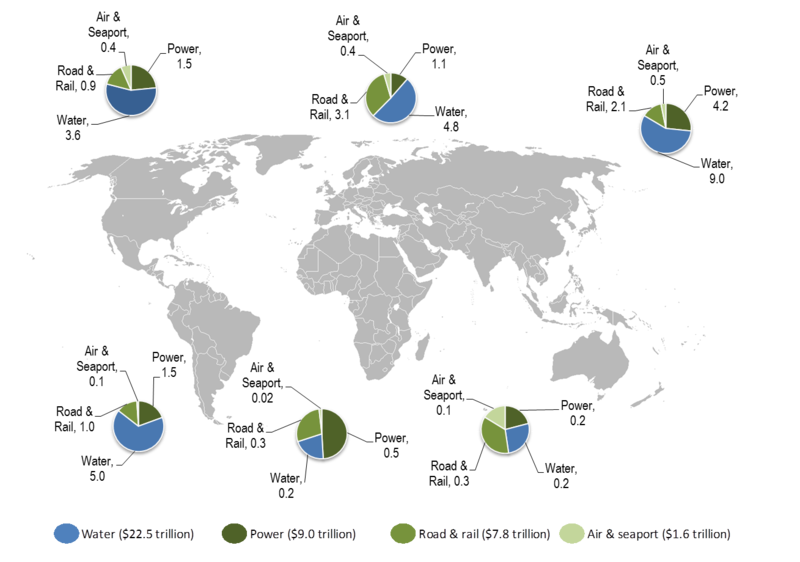 Water utilities are arguably one of the most defensive sectors of the global economy to invest in. 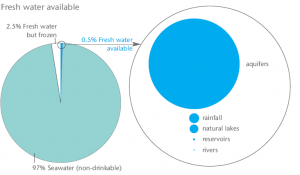 The demand for water is more inelastic than other goods and services since it is essential for life, has no substitute and doesn’t vary by changing consumer trends. In fact, we would argue that in a global downturn, business and consumers will reduce their consumption of energy. With regards to water, business may curtail water use to match output, but consumers and agriculture will continue to consume the same amount of water. 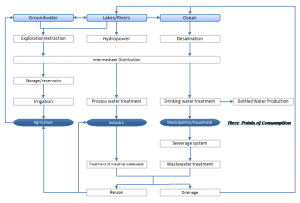 Moreover, due to the high capital requirements of water utilities and the way the distribution network is structured to meet demand, water utilities tend to be natural monopolies in their area of service. This adds long-term stability for investors. Over the last 20 years, water utilities have outperformed power utilities and S&P handily, particularly in periods of market turmoil. The only downside is there are only a few pure play North American utility stocks to invest in after several rounds of consolidation over the years. Water industrials also have performed well over the last 20 years since their largest customers are often water utilities. These however are more volatile in nature than utility stocks. Over the last 20 years, only water utilities and the S&P Energy Sector Index has outperformed water industrials in comparison to all other major sectors tracked by the S&P. On a go-forward basis, we continue to expect higher returns for both water utility and industrial stocks versus the broader markets as the water market fundamentals improve beyond historic levels (i.e. water pricing and infrastructure spend). In general we advocate individual investors lean towards larger and more liquid names in the water space. All North American mid and large cap water stocks reside on US exchanges. These larger comparables, as a group, have outperformed their Canadian listed counterparts handily since the start of 2011. We expect this overall outperformance as a group to continue in the coming years. Beyond individual stocks, there are several North American water funds that hold a diversified basket of water stocks that can be invested in.